The Society of 1789 (French: Club de 1789), or the Patriotic Society of 1789 (French: Société patriotique de 1789), was a political club of the French Revolution inaugurated during a festive banquet held at Palais-Royal in May 1790 by more moderate elements of the Club Breton. At their height of influence, it was the second most important club after the Jacobin Club. Among its members were Jean Sylvain Bailly, Mayor of Paris; Gilbert du Motier, Marquis de La Fayette, commander-in-chief of the National Guard; François Alexandre Frédéric, duc de la Rochefoucauld-Liancourt, Isaac René Guy le Chapelier, Honoré Gabriel Riqueti, comte de Mirabeau, Emmanuel Joseph Sieyès, Charles Maurice de Talleyrand-Périgord and Nicolas de Condorcet. The club kept an apartment in Palais-Royal where banquets were held. 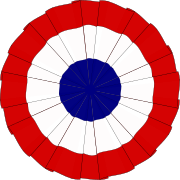 Its members were considered moderate and preferred for France to remain a constitutional monarchy in opposition to the republicans. The popularity of the club eventually decreased the same year as it was founded and the remaining audience went to form the Club des Feuillants, founded June 18, 1791. ✪ Part 1 of 6: Why Did a 'Liberating' King Meet the Guillotine? ^ Tackett, Timothy (2006). Becoming a Revolutionary: The Deputies of the French National Assembly and the Emergence of a Revolutionary Culture (1789-1790). Penn State Press. p. 273. ^ Étienne Cabet (1839). Pagnet éditeur, ed. Histoire populaire de la révolution française de 1789 à 1830. Paris. pp. 418–421. Retrieved 14 November 2014. ^ Timothy Tackett (2014). Becoming a Revolutionary: The Deputies of the French National Assembly and the Emergence of a Revolutionary Culture (1789-1790). Princeton University Press. pp. 277–290. ISBN 978-1400864317. ^ Israel, Jonathan (2014). Revolutionary Ideas: An Intellectual History of the French Revolution from The Rights of Man to Robespierre. Princeton University Press. p. 222.